Despite large-scale efforts to ban whaling for good, countries like Japan still slaughter thousands of whales every year. 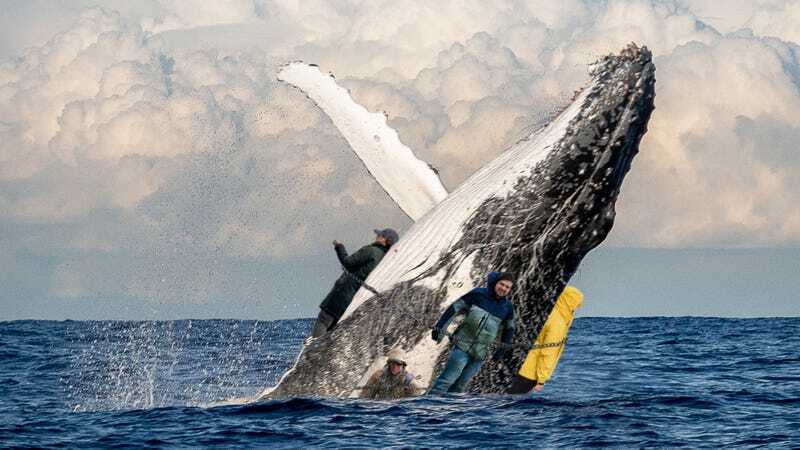 But a brave group of eco-warriors is making an incredible sacrifice in order to help conserve our seas’ precious wildlife: These environmental activists have chained themselves to a humpback whale to protect it from Japanese hunters. Absolutely astounding. “Courageous” barely even begins to describe these fearless wildlife advocates! Earlier this week, a hunting expedition out of Osaka was tracking down a mature female humpback, only to be foiled by WhaleSentinel, a group of 15 activists who had chained themselves around the whale’s body, leaving the whaling vessel no way to harpoon the animal without endangering several humans in the process. Since that first encounter with a hunting ship, the majestic whale has journeyed hundreds of miles through the sea, sometimes diving 100 meters underwater for extended periods of time—but the amazing activists at WhaleSentinel have held strong and refused to unchain themselves, all so that the beautiful whale may live safely in her natural habitat. Doesn’t this scale of personal sacrifice just blow you away? These selfless activists are fighting for a better world for all of us. WhaleSentinel members made it clear from the get-go that threats of arrest from the Japanese Coast Guard would not diminish their commitment to protect the whale’s life, shouting, “Stop the slaughter!” and attempting to hand out informational pamphlets to passing ships whenever the whale breached the surface. At this point, it seems like nothing can shake their dedication to the humpback they’ve defiantly chained themselves to, no matter how much seawater they swallow or how pruned their skin becomes. Give it up for these eco-heroes! One brave act of civil disobedience is sparing this beautiful animal from senseless slaughter. Seeing these environmental warriors chained to a whale just shows the impact a few people can make when they put others’ lives before their own. Hopefully this incredible act of conservation inspires more people to get involved, because our planet’s wildlife could certainly use a lot more allies like these!